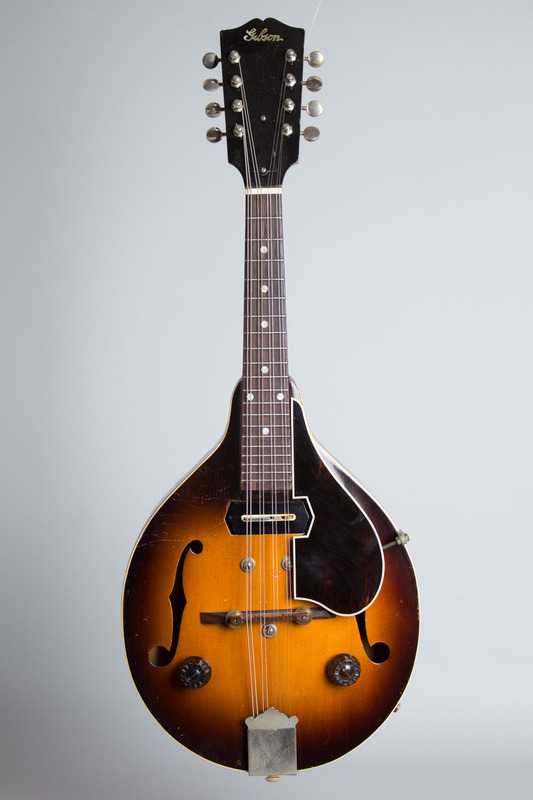 Gibson EM-150 Model Hollow Body Electric Mandolin (1937), made in Kalamazoo, Michigan, serial # 703-C-6, sunburst top, dark back and sides finish, mahogany body and neck, spruce top, rosewood fingerboard, original tweed hard shell case. 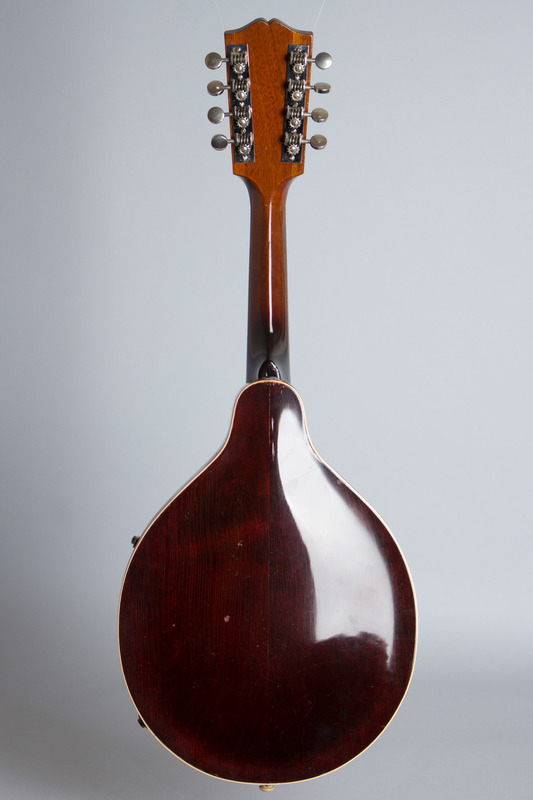 Gibson's EM-150 was the Gibson company's longest-serving electric Mandolin, in production from 1936 through 1971. 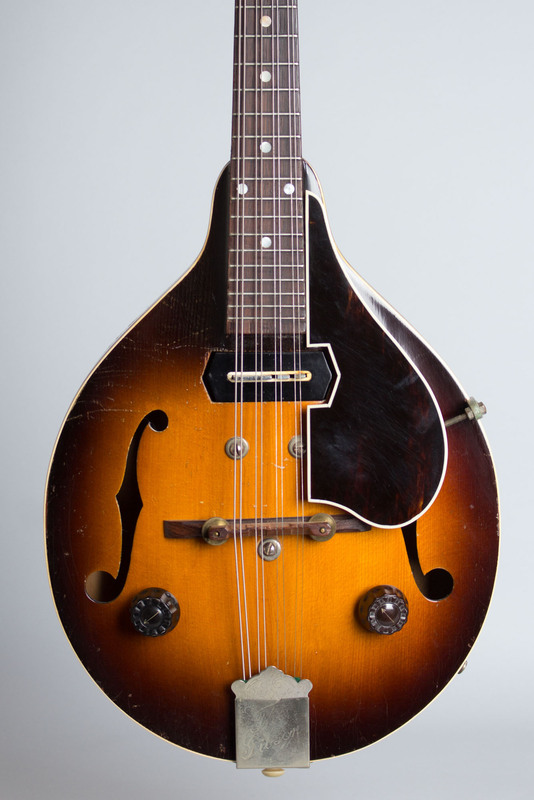 This first pre-war version is basically a standard A-50 style fully hollow body mandolin mounting a smaller-coil version of Gibson's earliest electric pickup, known the world over as the "Charlie Christian" model. The version of that unit used here has an unbound coil form surrounding the blade polepiece projecting thru the top, with the large flat bar magnets underneath. There is a single knob mounted on either side of the bridge for tone and volume-the large pots of the day would not fit on the same side! The sound is strong and percussive, but mellower than most other early electric mandolins, retaining some acoustic character. 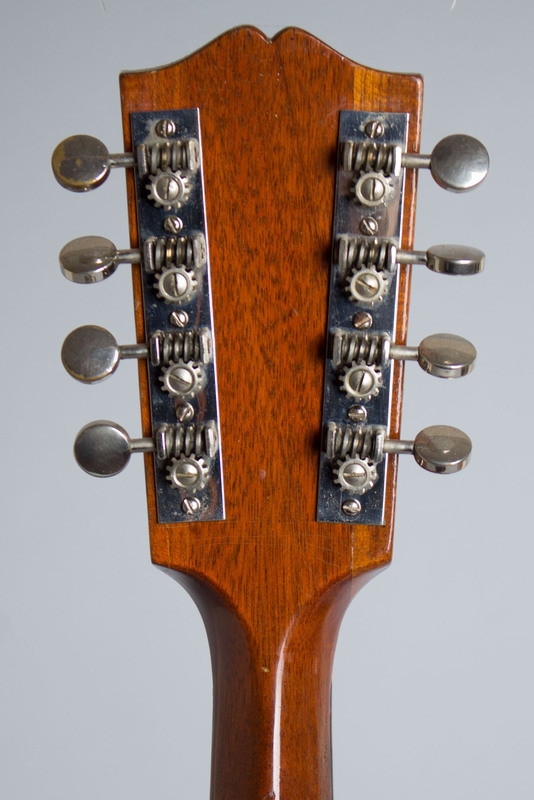 The cosmetics are typical Gibson for the era with a dark sunburst finished top in a dark stained maple rim, single binding on the front, back and fingerboard, pearl Gibson logo and dot inlay. 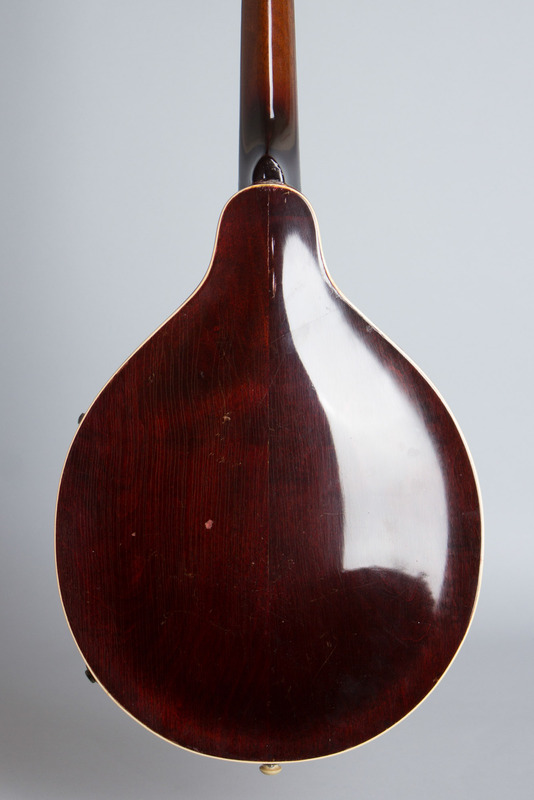 This first-generation EM-150 is a relatively rare Gibson instrument and a fine playing and sounding example of the company's coolest and most historically interesting electric mandolin. Overall length is 26 in. (66 cm. ), 10 1/4 in. (26 cm.) across at the widest point, and 1 7/8 in. (4.8 cm.) in depth, measured at side of rim. Scale length is 14 in. (356 mm.). Width of nut is 1 1/8 in. (29 mm.). Overall very nice condition; all original except for an excellent correct repro pickguard using the original bracket. There is some average wear overall, mostly some random finish dings, and the neck appears to have been reset some time back with overspray around the heel. 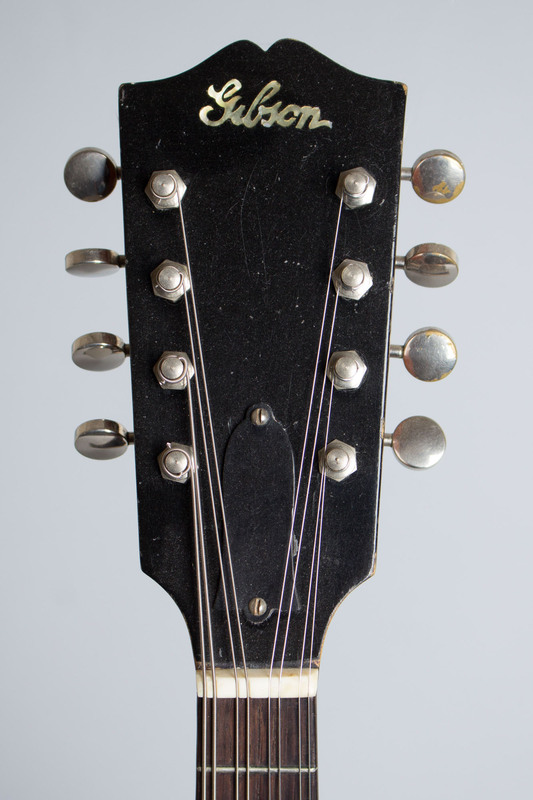 There is some typical fretwear in the lower positions, but the mandolin remains eminently playable. A cool and still very useful instrument, complete with the original HSC. Very Good + Condition.